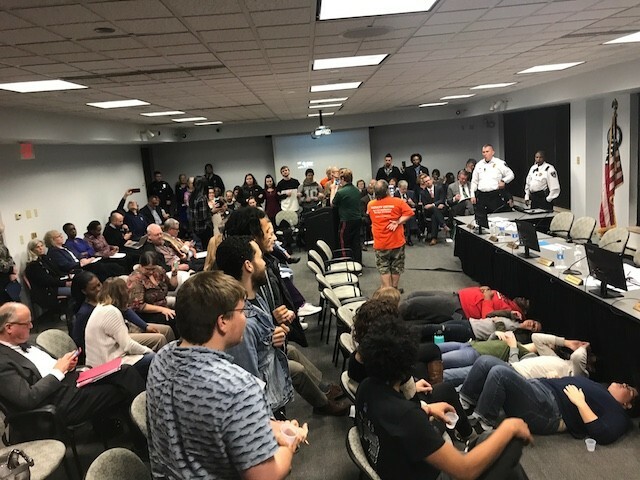 The Board of Trustees of St. Louis Community College wouldn't let anything deter them last night — not faculty urging them to consider other cost-cutting measures, not students taking to the floor in protest, not even chanting so loud, it made discussion virtually impossible. Huddling at the front of the meeting room after protests halted any action for a full hour, the board still managed to voted in big cuts that could include up to 95 job losses, 70 of them faculty. The room was so noisy even the Post-Dispatch reporter in attendance, Ashley Jost, had no idea what the board voted on until long after the fact. At 10:07 p.m., a new release from the college confirmed that the board had voted in the Budget Response Team's recommendations without major amendments: "a second voluntary separation incentive plan; an increase in cost-sharing of employee insurance premiums; audits and possible reduction of programs and courses that are inactive or have low completion; reducing up to 70 faculty, and reducing non-faculty positions by as many as 25." The board plans to give notice to affected staff members by March. They would keep their jobs through May, the college said, noting, "Employees who choose to participate in the voluntary separation incentive program will minimize the need for a reduction in force. Essentially, a buyout means saving a job for another person." The board authorized the cuts in response to an anticipated $13 million budget shortfall by 2020, which the college is blaming on enrollment declines and reduced aid from the state. 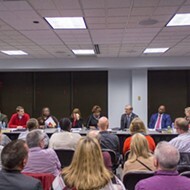 But the Budget Response Team's recommendations were met with a forceful response from both the SEIU Local 1, which represents adjuncts, at the National Education Association, which has a chapter at the college. 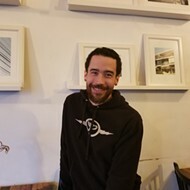 Attempts to push back against the administration's plans led to a math instructor being violently arrested in October — and calls for a vote of no confidence. Last night, students loudly signaled their anger over the plan, shouting, "Our education is under attack/What do we do? Stand up, fight back!" They also targeted Chancellor Jeff Pittman, who is paid more than all but one other president of a two-year public college in Missouri, chanting, "Chancellor Pittman, you can't hide/We can see your greedy side." The protests broke out just before the vote was scheduled to begin, around 8:15 p.m. At that point, five students took to the floor, lying down in front of the table holding the board of trustees with their arms locked. They would ultimately lay there for an hour as their peers chanted, loudly. 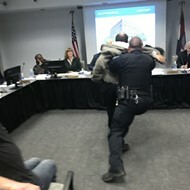 For roughly an hour, the protesters held the meeting at bay, their actions captured on a live stream as they shouted and forced the board into retreat. Yet the board returned at 9:20 p.m., and while the clapping and chanting got louder, faster and more excited — "No RIF! No RIF", they shouted, referring to the threatened reductions in force — the board still found a way to vote. By 9:30 p.m., they were done. “I think we can all agree that this was a difficult decision for the Board, but it was necessary. It’s our responsibility as leaders of the College to ensure fiscal stability and to face budget challenges sooner rather than later,” Pittman said in a prepared release. 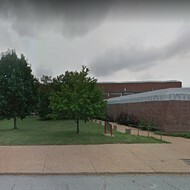 Editor's note: This story was updated soon after publication to add new information on the timing of the cuts based on the STLCC revised press release. We regret any confusion.